I'm pleased with my first row of sheep. I gave horns to the breeds which have them. From the left I've got: North Ronaldsay from the Orkney Islands, Hebridean from Scotland, Soay from England, Manx Logthan from England, and Lincoln from Kentucky. 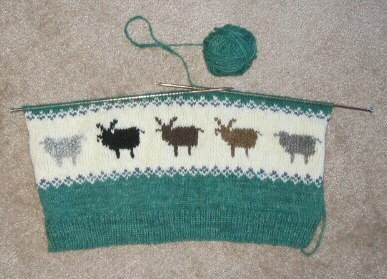 Next will be a green background row with white and light colored sheep. Later I will embroider in eyes and outlines of the faces. Here's a shot of the inside with the sheep in progress. 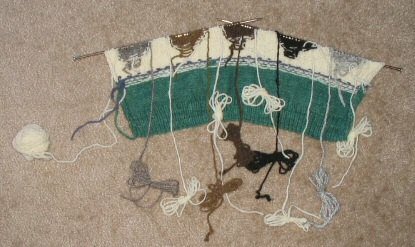 I stranded the legs (if back and forth with the same yarn can qualify as stranding), and intarsia knit the sheep as you can see. I am happy to report that I haven't had any battling butterflies so far. It's a great time to be sweater knitting, we just had our first hard freeze last night and frost was everywhere this morning. I love autumn anyway, I guess because it means relief from the summer heat. And I love the autumn colors, one of the things I truly miss about living in the northern US. I love colder weather because it means I can wear sweaters and wool! And since I've started knitting sweaters my handspun, I've begun to associate sweater knitting with the change of season. Another reason to love this time of year! oh my gosh, I love it! Oh to be able to knit like that - what a gift you have! Rather than butterflies have you tried the wool wound around lightweight lace bobbins (french type)? It may stop any butterfly wars, and they are not very heavy. Wow! It is looking so good. Wow! Those little guys look great! I like the horns too. Leigh, it's just gorgeous! I really love the sheep with and without horns according to breed - what a great idea. What a treasure this will be when it's done! I love cooler weather for the same reasons! I still haven't tackled shadowweave, but I'm enjoying your experiements. If you do ever pick up 'Mastering Weave Structures,' someone left me this link. It's for corrections to the book - eek! I still think it's wonderful though. Your sweater is turning out so cool! You obviously put a lot of thought into it and it shows! Wow that is just gorgeous. I can't wait to see the finished sweater! Oh by the way I love reading your blog. Ohhh! You are just too clever. BTW, my LL fleeces came today - if you need any more, give me a holler! Wow that's pretty. 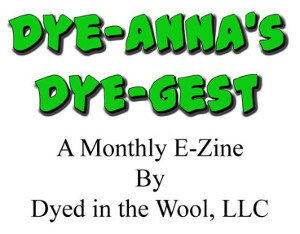 I'm still working on my very first knitting project...teaching myself to knit with books & online sites. I only know how to cast on and one type of knitting (don't even know what it's called) so when I think it's done, I'll have to learn how to cast off. But I'm spoiled by how much easier it is to crochet. There have been many times when I contemplated trying to turn it into a crochet project! LOL! Maybe I'll get it finished when I'm retired. Catzee sent me over because she said you accused her of putting your yarn outside??? what a great design! I love it.